The Fusion Impact Window is the perfect symbiosis of two exceptional features : the aesthetics and energy performance of aluminum with the durability and performance of P.V.C. 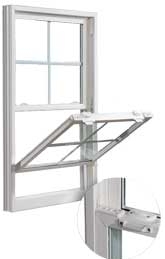 that are combined to produce an impact resistant window of unequalled protection and beauty. • All vinyl welded frames and sashes. • 3-1/4" frame depth. • Coextruded weatherstripping on casement. • 7/8" laminated insulating glass (with PVB). • Aluminum reinforcement in sashes on vertical and horizontal slider systems. • Steel installation strips.